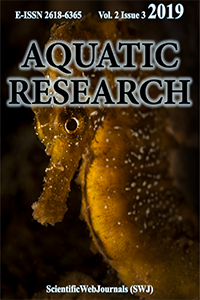 “AQUATIC RESEARCH" journal publishes peer-reviewed articles covering all aspects of Aquatic Biology, Aquatic Ecology, Aquatic Environment and Pollutants, Aquaculture, Conservation and Management of Aquatic Source, Economics and Managements of Fisheries, Fish Diseases and Health, Fisheries Resources and Management, Genetics of Aquatic Organisms, Limnology, Maritime Sciences, Marine Accidents, Marine Navigation and Safety, Marine and Coastal Ecology, Oceanography, Seafood Processing and Quality Control, Seafood Safety Systems, Sustainability in Marine and Freshwater Systems in the form of research, short communication, and review articles. All expenses of the journal are covered by the ScientificWebJournals. Processing and publication are free of charge with the journal. There is no article processing charges or submission fees for any submitted or accepted articles.